As long as I’m at it, the whole Pop Art movement was wrong as well. 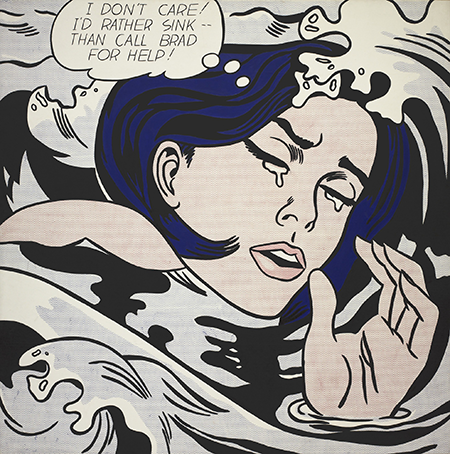 The artists of the Pop Art movement treated the comics as something disposable and shallow even as they tried to emulate them. It’s a pick ’em call whether they were reflecting them or critiquing them, but in either case I had a bone to pick with their terms and conditions. It would still be awhile before comics were accepted by institutions of higher learning and elevated to the status of a legitimate art form, but from the get-go, work of genuine quality was always present and appreciated by the cognoscenti twelve years old and up. It never occurred to me that comics should be denied a seat at the art table. It was always my unshakable belief that comics could achieve substance and chronicle like any other art form what it means to be human. I bring all of this up for two reasons. One, I needed a way into this intro, and, two, I wanted to make a couple of points (it’s always nice when you can do both). I wanted to clarify my mind-set at the time the strips in this volume were being created. As I mentioned in the previous volume, my work had been slowly edging toward the idea that my characters could evolve. That their perceptions and personalities could be molded by events. In short, I wanted to introduce drama into their lives. But as I also discussed earlier, it would have to be done in the face of prescriptive expectations as well as cultural and editorial resistance. The years contained within this volume are where that process begins to gain purchase. The teen pregnancy series will provide the beginnings of an answer, but I would be tiptoeing into my sixth decade before I would truly seal the bargain I was about to make with myself. To move toward this future, I would need to look to the past with an eye toward reclaiming the full genetic code of the American comic strip.